Lab Supply has a great selection of animal products for an extremely wide variety of animals, including Rodent Nesting Sheets. These sheets are contaminant screened and made of 100% virgin wood pulp, and therefore perfectly safe for your rodents. The natural components of the sheets ensure that there is no lint so there is no possible eye irritation, which means that these sheets are better for your animals than cotton nesting material. 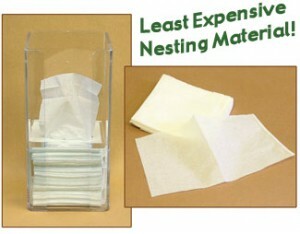 If you would like to know more about these Rodent Nesting Sheets, please click here to view this product in our store.